VENUS LEGACY is the first all-in-one medical-aesthetic device that combines multipolar technologies and magnetic pulses (MP)2 to the new VariPulse characteristic. This technology allows to safely and efficiently treat various conditions. It is approved by Health Canada and by the FDA (Food and Drug Administration) for the treatment of cellulite, excess fat and skin sagging. 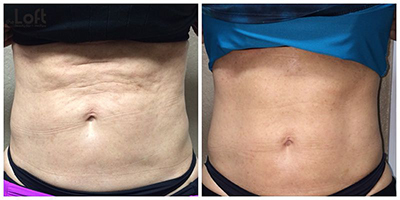 VENUS LEGACY treatments are non-invasive and painless. A heat sensation will be felt during the treatment as well as an intermittent suction, many of our Loft patients say how relaxing the treatment is & how they look forward to the procedure & compare it to a spa treatment. In general, a session lasts between 30 to 45 minutes. You can return to your daily activities right after your treatment, since there is no pain nor side effects. VENUS LEGACY offers quick results to reduce cellulite and volume, while improving skin tone. All areas of the body can be treated. The privileged areas are: neck, face, thighs, buttocks, arms, stomach and the back. An improvement is usually visible right after the first session. 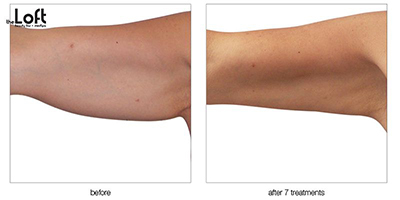 Generally, 6-10 weekly treatments are necessary to obtain long-lasting results. Fat cells, also called adipocytes or lipocytes, contain stocked fats under the form of triglycerides. Triglycerides are composed of 3 fatty acids. Lipolysis is obtained when we heat fat cells to a temperature of 43 degrees for 10 consecutive minutes. Venus Legacy reaches well above 43 degrees while maintaining complete comfort for the patient. Our friendly and knowledgeable staff members are on hand to discuss Venus Legacy™ prices as well as any other aspect of your desired procedure. For your financing needs we offer in house affordable payment options. Treatment will vary from patient to patient, and we suggest calling our office today to schedule your free, one-on-one consultation with our highly trained Medical Staff. The Loft Beauty Bar & Medspa is proud to offer financing for our services. This 0% & Instant Approval system we’ve incorporated allows you the opportunity to take advantage of our treatments today!